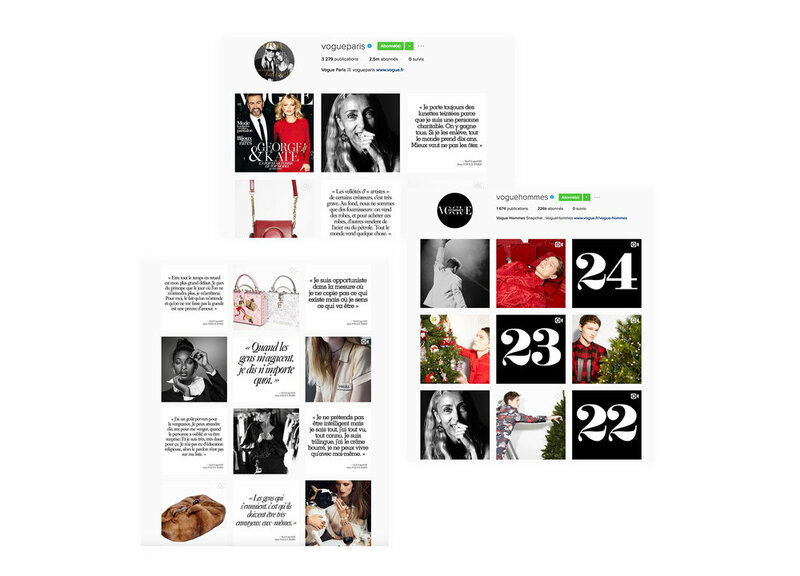 Several pages from Vogue Paris I have designed, included Visual templates, Market post, Runway page, Vogue Paris Live page, Diaporama page, etc, & mobile versions. Everyday a new Big COVER design for Vogue Paris homepage. Each day a story, each time a different vibe. 60% of Vogue Paris viewers are on mobile, mobile design is significant. Here is a Long Form design I have created, the result is an easy to read, visually pleasing, exciting content for the user. Re Design of the new Vogue Paris Homepage. Internally more efficient and visually more minimalist and clear.. I have designed the Snapcode logos for Vogue Paris and Vogue Hommes, a beauty logo called Beauty Report for a daily beauty post during Fashion Week, as well as the Vogue Follows logo, used for the Vogue Follows videos series. I have created several videos for Vogue Paris, for Instagram, Facebook and more. Here is one example for Snapchat's launch. A lot of fashion collages was also made for the Vogue Paris website.